Tata Motors 500570.BY -0.13% ‘ once-lonely Class A shares are getting some overdue respect. There’s reason to think the love fest could continue. India’s most valuable car maker gives investors the choice between two stock listings. There are regular shares. And then there are Class A shares, which carry a tenth of the main stock’s voting rights, though pay a higher dividend. Over the past five years the Class A shares have languished at an average 39% discount to the main shares, an unjustifiably large gap. It got as wide as 52% in March. The ordinary shares are more liquid, though not meaningfully so. Another factor is that the ordinary shares are traded in both Mumbai and as American Depositary Receipts in New York. The Class A shares trade only in Mumbai, reducing investor interest in them. Lately, though, the gap has narrowed rapidly. Class A shares have raced 69% higher over the past three months, leaving the ordinary shares, up 15%, in the dust. That’s closed the distance between them to just 27%, with a chunk of that narrowing in recent days. Also closing the spread is simply that the Class A shares, which weren’t well-known earlier, are gaining popularity. Seth Fischer of Oasis Management promoted the trade at Hong Kong’s Sohn hedge fund conference earlier this month. A rush of liquidity into Indian stocks along with the election of Prime Minister Narendra Modi has also played a role. The last time the spread between the two Tata shares was so narrow was in the fall of 2010, when the U.S. Federal Reserve’s bond purchases sent a wave of capital toward emerging markets, especially India. The spread could continue to narrow, given that the benefits of owning the two are so similar. Yet even if it doesn’t, the Class A shares should at least rise in step with the regular stock. The company’s Jaguar Land Rover division continues to grow sales, especially in China. And at home, Tata’s truck business stands to benefit hugely should Mr. Modi push hard on infrastructure investment. Tata has more than half of India’s truck market. 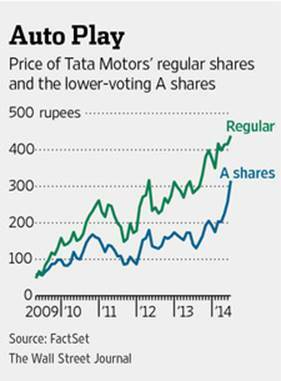 Tata’s two shares have been like the tortoise and the hare. The tortoise remains the one to bet on.